Low Form Beakers with pour lip pressed from one piece with flared tops and slightly tapered walls. Low Form Beakers with pour lip pressed from one piece with flared tops and slightly tapered walls. 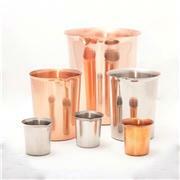 Metal beakers are polished inside and out.